Sometimes when our worst fears come true, we can only to gether all our courage and go all the way through. This doesn't sound like a lot of fun, but that is the story behind Tales From The Dragon Mountain. Soon you will find that you are the one to fight some dark spirit. 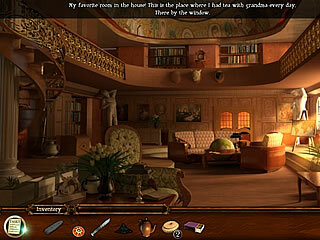 You play as a youg woman who tells you about her childhood memories of her grandmother. One thing in particular is the stories that her grandma was telling her about some fairy creatures. Years later she had a dream about her grandma's house burning. She goes to the place and slowly understands that things are not that simple and some of those creatures from the stories were not that imaginary. Soon you will find that you are the one to fight some dark spirit. The game offers three modes. You can choose the pace at which you want to play the game. Most of the time you are going to walk around in search of items to use together somehow. There is a lot of focus on the inventory. You don't just use them somewhere on the screen, you are also to figure out the ways to combine the items in the inventory before you can use in in a scene. 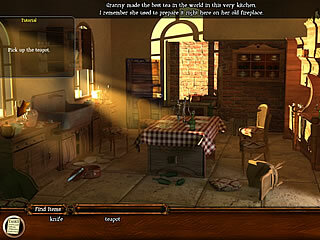 The hidden object levels are not too populat here, but you still get to play some sort of them. And of course there are also different mini-games to play. I have to admit that some of the parts of the game were a bit confusing. Sometimes you are just lost. The general presentation is pretty good, though if you are not new to the genre, you probably saw games that look better. But n the upside the voice over is rather impressive. The game is definitely not bad, but the more experienced gamers will notice all the little details that make me give 4 this game. This is Tales From The Dragon Mountain: The Strix review. Download this game here.